In between the 1960’s and 80’s Ajanta and Ellora drew the attention of many scholars, historians and researchers who explored these caves, evaluated and analyzed them, and not only wrote research papers but also book. 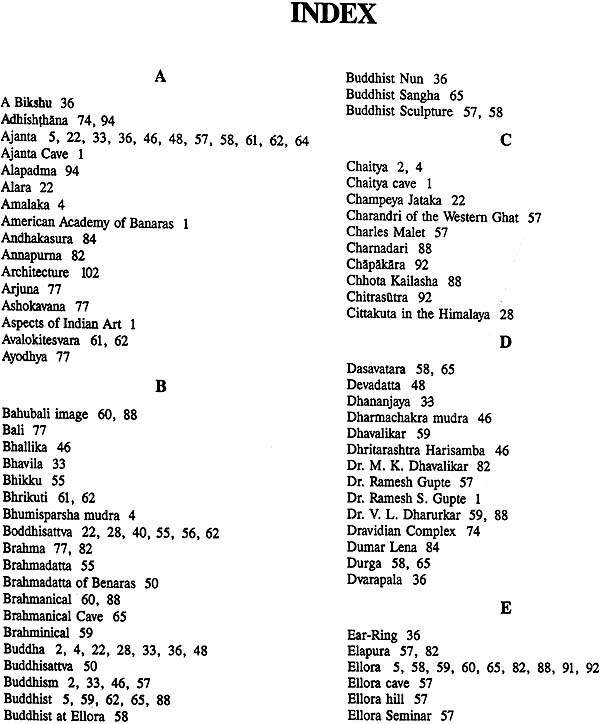 However there were more books as well as articles published on Ajanta compared to Ellora. Form the 1980’s to nearly 2000 and a little later the number of scholars, researchers working on these caves swindled, though a few continued to be loyal and committed to Ajanta. These later books concentrated on studies related to certain theories of time span, historical perspective, an exhaustive comparative study. These were all serious studies little comprehended by the common readers. Hence the present book is mainly written with the objective of presenting a descriptive study of both Ajanta and Ellora as well as in-depth study of textiles, jewellery of Ajanta etc. for the general reader audience who desire to understand details of sculptures, painting and architecture to understand details of detail of sculptures, painting and architecture. The script is also supported by line drawings and photographs, ground plans and maps to offer a more graphic perception and appreciation of the caves. This book will serve a crore section of society who will definitely enjoy the visual commentary on these renowned cave temples. Both these world heritage sites have also the added advantage of financial aid by the Japanese International Cooperation Agency (JBICA) that has supported the development, landscaping and beautification of these monuments. For the tourists all facilities, amenities and services are provided. The book also takes note of these developments. Prof. Dulari Qureshi has recently retired as a Professor and Director of the Department of Tourism Administration. She has made a special mark in the scholarly circles through her books on historical monuments of national importance that include “The Art and Vision of Aurangabad, Daulatabad Fort”, “Rock Cut Caves of Western India” and several other books. 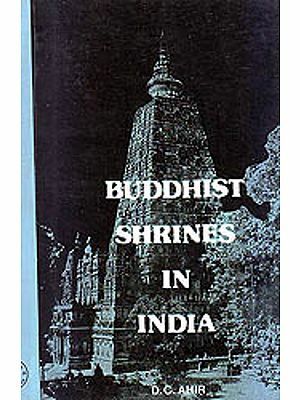 She is also one of the editors of four volumes on the Encyclopedia of Hindu, Buddhist, Jain and Islamic Architecture. Two more books are under publication. She has written 712 articles, features and interviews on Heritage, Art and Architecture on the national newspapers like Times of India, Indian Express, State level news papers like Maharashtra Times, Koksatta and Sakaal and local newspapers like Lokmat Times. A special news magazine under the title of ‘Art and Glamour’ published many of her articles and news features. Besides she has contributed several research articles to National Research Journals like Journal of Marketing, Research Books, University Research Journals and Commemoration volumes. She has also offered consultancy services on Promotion and Marketing as well as visitor management center at Ajanta and Ellora to JICA and MTDC. She gave inputs to web designers on designing websites on Aurangabad Tourism. She was a script writer for a documentary on Aurangabad: A Land of Hidden Treasures for tourism conclave. She received a Lifetime Achievement award from Maharashtra Chambers of Commerce, Industry and Agriculture, a state level award from 75th Akhil Bhartiya Marathi Sahitya Parishad for her contribution in Historical Research and from Tourism Promotion Guild (a local Travel and Hotel agencies association) for promotion of Aurangabad as a tourist destination. Dr. Dulari Qureshi is putting in sincere efforts to promote Aurangabad as International level by delivering lectures on Ajanta and Ellora in foreign countries. Her recent public lecture in the Wisconsin University at Madison was highly appreciated and applauded by the audiences. Ajanta and Ellora cave temples are two different worlds where the power of the soul is enriched and the human race feels happy and ennobled. Within the aristic rendering of sculpture, painting and architecture, there is a deep spiritual touch that wakes the conscience of even a non-believer. That art is rhythmic where the spiritual purity merges easily with sensual joy. Both the sites contain masterpieces in painting and sculpture where beauty is wedeled to science on one hand and religion on the other. The technical compsitions of each rendering is so perfect that there is clear mathematical precision blended so flamwlessly with imaginative falvors. Ajanta is a dream world where the paintings that declineate the Jataka kathas take you to the ancient world which is artistically synthesized with the divine. More renowned for stirring and emotional chord the Ajanta paintings are tender and touching. There is no presence of anger but love, sympathy and empathy. While the second site of Ellora a pluralist site with three religious harmoniously co-existing together is however different. The first group of caves that are Buddhist are similar to Ajanta in evoking peace and tranquility amongst the visitors. But the second group that is the Brahmanical cave portray all the human emotions, anger, hate, love, greed and destruction. There is action, excitement, energy and vitality. All the grouped like a forest, whose thousand waving arms are led by Natraja the Master of the dance. The third groups of Jain caves have beautiful images, females very delicate, feminine while male images too are effeminate. But the art is different where the philosophy is cold and hence there is no emotions depicted. But the decoration and ornamentation of pillars is extremely intricate and beautiful. Both the world heritage sites have received ample attention form explorers, scholars, researchers, travel writers and eductioninist. Foreign and Indian writers have written volumes on both the sites especially Ajanta. However there has been a gap of several years since any scholar or researcher has written on these caves, except for a few research articles here and there. Most of the existing old work presently is either our of print hence not available in the market or outdated. In such circumstances a strong need was felt for a good book on Ajanta and Ellora. It is my privilege to pen a Foreword for Prof. Dulari Qureshi’s book which not only describes each and every cave of both these sites but also includes several line drawings, photographs and maps that makes it easier to comprehend both the cave temples. The author also adds research on textiles of Ajanta as well as work on a few master pieces of both Ajanta and Ellora. The introductory write-up also embraces tourism development work at both the sites. The modern day facilities and services that have been developed making visits to both the caves more convernient, easier and comfortable, with state of art airport, comfortable and luxurious transportation and other facilities at both Ajanta and Ellora have been dealt with in detail. The present work by Prof. Dulari Qureshi indeed has made a very good effort at easier understanding of these two world heritage sites. There are very few scholars in the University to research and examine these monumental sites and we need scholars like Prof. Dulari Qureshi to work in this field, to record and explore new research avenues, and enrich the cultural horizons of the region. I sincerely hope that she continues this good work of enlightening the scholarly world and wish her the best. Ajanta and Ellora are monumental treasure-troves that can be explored, researched, probed and investigated by numerous scholars, academicians and historians but there will still be something to investigate. Both these sites are fathomless for research. However more number of researches have shown a marked predilection for Ajanta cave temples while Ellora cave temples still remain a virgin historical site that needs to be explored and examined. 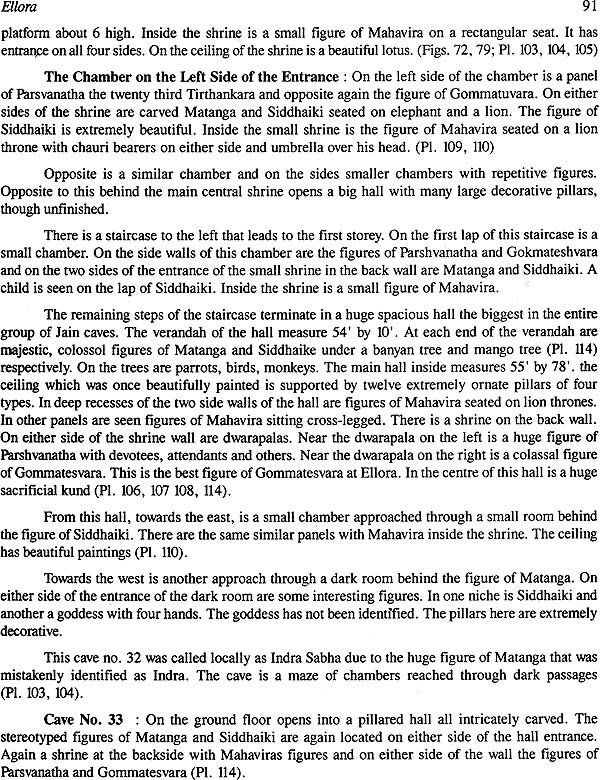 Not a single scholar ahs even systematically documented these caves though only late Dr. Ramesh Shankar Gupte has practically documented these caves through his books on Ajanta, Ellora and Aurangabad caves as well as Hindu, Buddhist caves of Elloraa. A few scholars have also studied the architectural aspects, socio-cultural and economic aspects and religious significance of the caves. But areas like the plurastitic aspects which is a political system of power strong dictatorial authorities the geological or geographical studies, microscopic studies that could include trade routes, foreign travelers, environmental studies, tourism impacts etc. But presently very little serious work is being conducted. There is a dearth of earnest and profound research work on the Ellora caves and Ajanta caves. The local University has a History Department, but unfortunately after Dr. Ramesh Shankar Gupte a few Head did some work but nothing that can be considered scholarly. While the Japanese Government is spending crores of rupee on its development high quality scholarship is lacking at both the sites. In the art world Ajanta and Ellora are a virtual goldmines of the most exclusive paintings, sculptures and architecture in basalt rock. Excavated in the Sahyadri ranges of the Deccan trap rock the caves bring down on earth the celestial land of gods. It was during the ancient period from 2nd century B.C. to 11th century A.D. that these caves were excavated. Whether you go to east. West. North and south of the world it is impossible to witness something so dynamic that leaves the visitor spellbound and speechless. Following the number of books and articles written on Ajanta and Ellora it is obvious that the art scholars, researchers have accepted these two world heritage monuments as Indian classical heritage that are amongst the eight wonders of the world. It is difficult to understand how famous or influential they were in the past as beyond a few contemporary references by the Chinese traveler Hieun Tsang, the puranas, the copper plate inscriptions and also medieval period reference in records of Aurangzeb Hasan Ganga Bahamanis records of his visit to Ellora caves there is very little contemporary reference. However the modern age writers right from 18th century to date have written monumental works on Ajanta and Ellora. Though Ajanta happens to be a more popular site with most historical scholars, researchers and even modern travel magazines, Ellora has been a more neglected site, offering immense scope for modern hestorians and researchers to put more light on these caves. Probably the consistent research on Ajanta and Ellora done by writers like Ramesh Shankar Gupta and later by Walter Spink has brought these two sites on world map. But the excessive attention by Walter Spink given to Ajanta has been specially responsible for exhaustive work done on Ajanta. 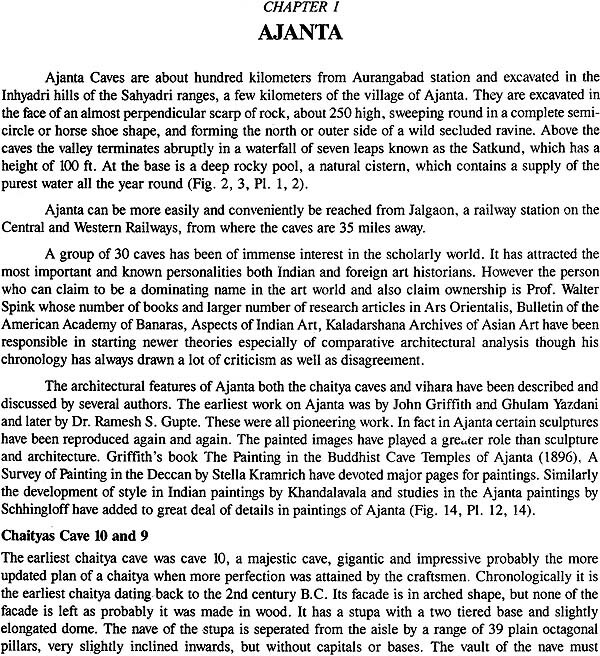 Several of his articles published on Ajanta in historical journals like Arti us Asae, Ars Orientals, Ars Buddhica, Art Bulletin, Kaladarsana Marg and several commemoration volumes has focused the world attention more on Ajanta, comparatively exhaustive research work has not yet been done on second important site of Ellora. Though B. codrington and J. Perrirai projected a three part survey of the temples (which did not materielise) still there has been no ownership of Ellora by any modern art historian or scholar who can claim to have done the kind of huge work done on Ajanta. Ajanta the more ancient site dating back to the 2nd century B.C. was lost to the world for more than thousand years and only re-discovered in 1819 by John Smith and his companies from the Madras Regiment. It was only gradually that even after several years of its discovery that the cave temples gained the interest of the world and around the late 19th century did it get noticed by visitors. Though individual explores throughout the 18th, 19th century continued not only visiting the caves but also writing about them, it was only by early 20th century that tourists started viewing the caves as a singinficant tourist site. In the 1960’s, 70’s and 80’s the number of tourist started rising. Comparatively the neighboring site of Ellora was never lost to the world and was visited by travelers, medieval rulers, noblemen explorers and pilgrims. Though th(vii)(vi)(vii)(vi)(vii)(vi)ere are scarce puranic references to the religious context, Tirth at Ellora as mentioned by Michale Soar in her research there is no ancient reference to Ellora. A 13th century Marathi literary work, the Lilacharitra compiled in 1278 describes a visit to the caves by the famous saint Cakradhara. Swami Another medieval Marathi story about queen Manikavati and the king of Elapura also refers to Ellora as a Hindu site Ellora is also mentioned in the Chromicles of Aurangzeb. Travelers from Europe like the French traveler Jean de Thevenot visited the the caves in 1666 while another traveler visited the caves in 1701 to 1702. J.B. Seeley’s. The wonders of Ellora or the narrative of a journey to the temples or dwellings excavated out of a mountain of Granite at Ellora in the east India 1825 gives detailed account of the visit. 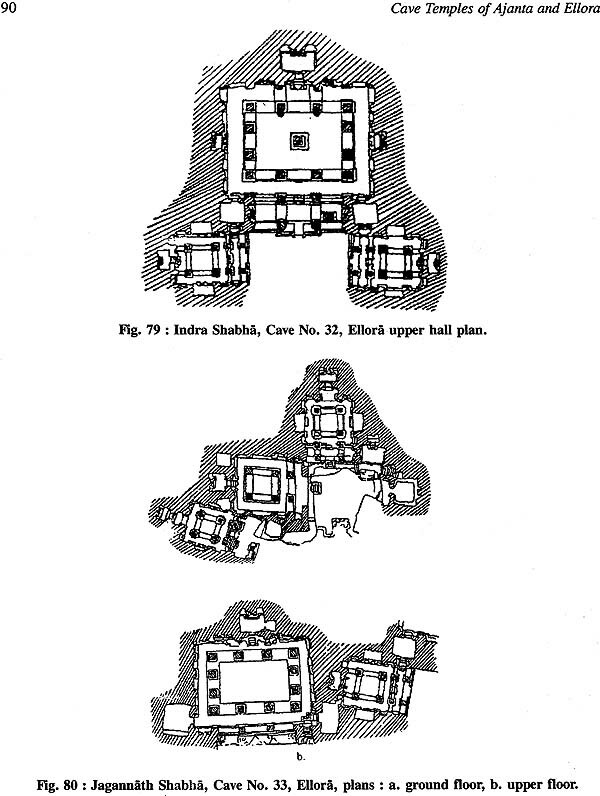 As per Dr. Ramesh Shankar Gupta’s book on Iconography of Buddhist caves Al-Masudi a muslim Chronicler of the 10th century A.D. also refers to Ellora as dedicated entirely to the pious. Dhavalikar’s research article on Kailasha is intereting. H Goetz believes that Kailasha took two and a half century to complete. 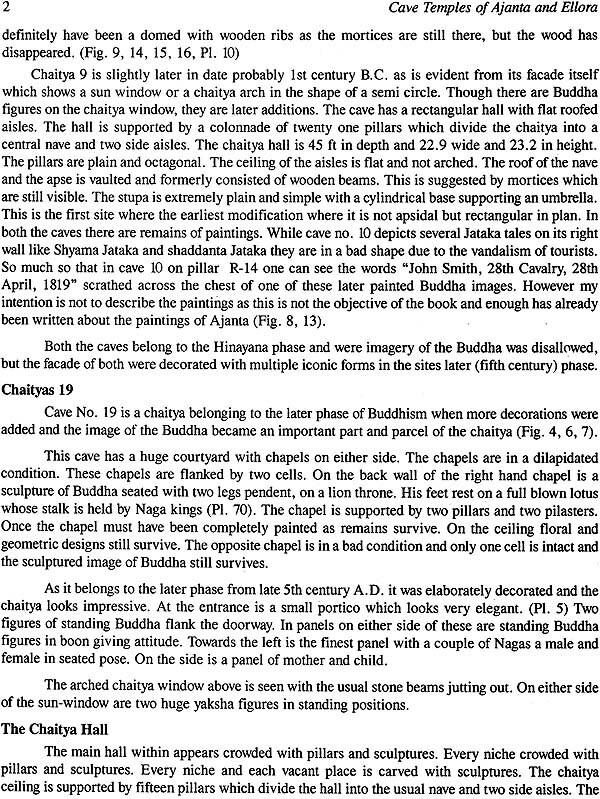 As per Dr. Ramesh Shankar Gupte’s book the Iconography of; the Buddhist Sculpture (Caves) of Ellora there are passing references to Ellora by foreign authors like Thevenot (1633-67), Niccolao Manucci (1653-1708), Charles Warre Malet (1799) and Captain Seely in 1924 (The wonder of Ellora). The Urdu work (Muhamed Abdul-I-Jabbar Sufi, Tadhkira-I-Salatin-I-Dakan pg. 147 to 150) refers to the approach roads to Ellora caves being repaired for the visit of Sultan Hasan Gangu Bahamani who camped near the caves in 1352 A.D.
Later authors, scholars on Ellora included D. Chatham, (1981) Pratiharas from Pattadabal to Ellora in A Krishna Chhavi II (Banaras Bharat Kal Bhavan) pg. 71-79, W. Spink, Ajanta to Ellora, P Sterne Colonnes indienes d’ Ajanta et al Elora, S. Czuma, The Brhamanical Rashrtakuta Monuments at Ellora pg. 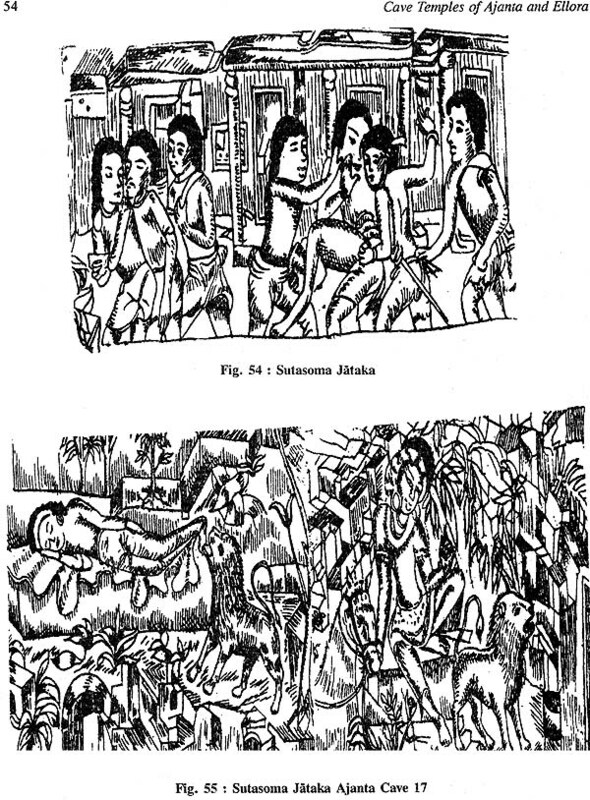 1968, R. Parimoo, Ellora Proceedings (1988) A.K. Bhatia, Tourism in India: History and Development (1978) New Delhi Sterling Publisher, Micaela Soar, The Tirtha at Ellora in R. Parimoo Ellora Caves Sculptures and Architecture, New Delhi 1988. Several authors have written articles or small booklets or books on Ellora but no exhaustive documentation of these caves has ever been taken up not even by the Dr. Babasaheb Ambedkar Marathwada University’s professors from History Department which is more feasible and appropriate due to the advantage of its close proximity to the caves. Except for a fairly good amount of work done by Dr. R.S. Gupte, than the professor and Head of the History Department nobody can claim to have taken this work seriously. As Dr. Gupte has written two books on the Iconography of Hindu, Buddhist and Jain Caves and the Iconography of Hindu Caves. He also wrote a first descriptive book on Ajanta and Ellora caves. But later scholars focused more on dating, chronology and went to lengths to prove their point. There were very few writer who studied the social or economic aspect of the caves exhaustively except for Dr. Dhavalikar on Ajanta and Dr. T.V. Pathy on Ellora’s Cultural Aspects. Of course Ajanta has been a more popular site for explorers, scholars, researchers and educationists as is obvious from the voluminous works done by pioneering writer like J. Griffith, “The pantings in the Buddhist Caves Temples of Ajanta” two volumes (London 1896) and Ghulam Yazadani, “Ajanta” in four parts each with text and portfolio of illustrations (Oxford 1930, 1933, 1946 and 1955). 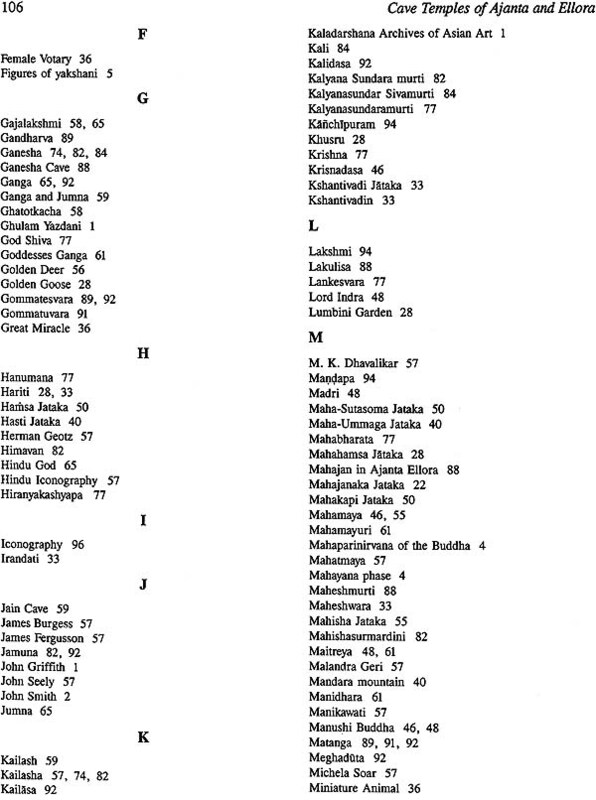 Other authors who also wrote exhaustively on Ajanta are James Burgess and James Fergusson. James Burgess “Rock Temples of Ajanta, Indian Antiquary, III, 1874 pg. 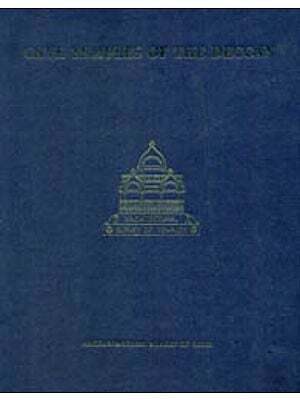 269-274, The Cave Temples of India (London 1886). However there is only one scholar who can claim ownership of Ajanta caves, who has since nearly 40 years lived and breathed Ajanta visiting it each years and staying at least for 3 to 4 months. Walter Spink who also has been and inspiration for dozens of writer in their special emphasis on chronology has written more than 100 articles in various research journals, commemoration volumes and also published a few books. Walter Spink inspired the writings of Malandra G.H., Dr. Dhavalikar and many more scholars whose writings reveal strong influences of Walter Spinks obsession with chronology on the grounds of stylistic Comparisons. While Ajanta has always been more famous for its three dimensional paintings, Ellora another site in close proximity has been more renowned for its rascinating sculptures. Though Ajanta caves also have sculptures and most breathtaking sculptures they are mostly smaller and more delicate. The sculptures of Ajanta are finely rounded and while the Greek sculptures that accentuate the physical prowess through the muscle power, Ajanta sculptures are more feminine or effeminate with even male shoulders carved smoothly and the torso too is flat minus any muscular toning. At Ellora the sculptures are gigantic, though not as flat as Ajanta here too the sculptures reveal no muscular strength. Whereas at Ajanta the Gods, Goddesses, and semi divinities are carved in the image of tomosapien; with two hands and in the same form, but at Ellora in the Hindu group of caves the sculptures display many arms. The many armed images have come under criticism by many Euroean art historians. 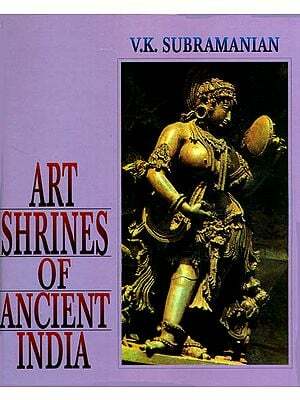 Vencent Smith states, Indian Sculpture properly so, called hardly deserves to be reckoned as art. The figures both ot men and animals become stiff and formal, and the idea of power is clumsily expressed by the multiplication of members. The many headed, many armed gods and goddesses whose images crowd the walls and roofs of temples have no pretensions of beauty, and are frequently hideous and grotesque. Mr. Mashell Speaks of “These hideous deities with animal heads and innumerable arms”. The condemnation is certainly unjustified as a piece of art is praiseworthy if it can express the passion that animates it, it should exhibit rhythm and movement of living things. And the sculptures of Ellora are so vibrant, vigorous that they appear truly impassioned. Many of these images at Ellora exhibit the power and strength that is bestowed exclusively on gods who are different form common human beings. The dances of Shiva at Ellora are some of the most unique images that infuse the varied characteristics of creation, protection and destruction of ignorance and darkness. The sculptures here are art. Its universal in its appeal to all nations, races, religion and creed. The creator has put in all his efforts, mental and spiritual to create these plastic forms to give expression to the inner thought through exterior movements. Ellora, especially Kailasha, a poetry in stone has created some of the most awe inspiring, amazing plastic forms that have remained in the memories of the most fastidious critics. The image of Kalyan Sundara murti in Kailasha in its back corridors exhibit the beauty of a newly married couple when parvati the bride blushes endlessly at the first touch of her Lord Shiva. The artist details her first flush and glow ghrough the two feet that brush each other out of pure bashfulness, her head slightly turned, too timid to directly look into the eyes of her bridegroom, one of the most beautiful sculpture that makes it obvious that the artist had reached a crowning glory in creating plastic forms and infusing it with real life. One of the most ingenious figure of Ardha-narishwara is herein Parvti and Shiva become one with the characteristic of both male and female in one image is indeed an example to what height of art and aesthetics the artist and master craftsmen had reached. However one the most wonderful panel is Ravana shaking Kailasha on the right side of Kailasha. An image that is glorified and venerated for its strength and the deep significance wherein Ravana is shown shaking Kailasha while the common man runs helter skelter out of fear, where the musicians are running with their musical instrument on their heads, the monkeys are climbing higher on the trees while Parvati is clinging to her husband as is normal for a female. But Lord Shiva’s only gesture is surprise (vismaya) where he is shown surprised that anybody could dare disturb the peace of Kailasha (Shiva’s avide). A realistic representation of the perpetual war between good and evil, between the gods and the demons and always in deva-loka it is the ‘good’ that wins over the evil designs of the demon. The panel it self narrates the story in a very simplistic style. Ellora is a monument of information that a genuine researcher can dig or investigate into and come out with exhaustive information that can be contained into minimum ten volumes. No single researcher has even as yet dared to complete the documentation of each cave due to its expansive nature. It will be time consuming as the researcher will need to spend at least a period of ten years to complete something of this dimension. It will probably require patience, sacrifices, intellingence, physical stamina and mental energy. The second site of Ajanta is more fortunate in evoking the interest of many scholars, probably due to its compact nature, natural beauty and more easier perception. The paintings that are spread on the walls. Pillars and ceilings of caves no. 1,2,9,10,16 and 17 contain geometrical ad decorative motifs and designes on the ceiling and pillars while the walls of the temple display the jataka kathas. Though detailed work on its chronology, dating, art and aesthetics have been done as well as its political patronage comparatively work on the social, economic and cultural aspect is sketchy. Though cultural aspects has been studied by Dr. Dhavalikar, Ajanta A Cultural Study it is a sketchy study and needs a lot of additions. Though some amount of work has been done on th ‘Textiles of Ajanta’ and ‘jewellery of Ajanta Paintings’ by Dr. Dulari Gupte Qureshi every such minutal aspects needs to be touched. Architecture, art objects, decorative motifs and designs, geometrical designs utensils, arms and armour, flora and fauna that as yet has not been dealt with by any scholar. The Ajanta paintings reveal the legend of the fabled fabrics of a bygone era, variegated, magical and in kaleidoscopic colours. The exquisite genius of the craftsmen and artisans of those days. As one moves form cave to cave viewing the paintings, one perceives textiles of the finest quality, showing excellent weave texture and decorative motifs, reminding us of descriptions to be found in classical Sanskrit drama. The textiles in the paintings display a patient weave, elegant embroidery and tie and dye techniques, embellished with the touch of master hands. The art of textile making in India is an ancient one. According to Dr. Dhavalikar (in his book ‘Ajanta: A Cultural Study’) a significant discovery was that of a piece of cotton cloth sticking to a silver vase excavated in Mohenjodaro. Similar cloth was called Sindhu in Babylonia and Sindon in Greece. It was made of cotton and it originated from India. Ancient Vedic texts also refer to several varieties of cloth such as Dursa, Ksauma and Tarpya. Some among these some were obviously silk. The Mahabharata refers to shining golden woven cloaks and there are references to Manichura probably a fabric with a pearl woven fringe. The ancient text Harsacharitra mentions a cloth Indra Yudhambara, meaning a rainbow which also finds mention in the Kadambari texts. The ancient historian Bana records that emperor Harsa’s robes were ornamented with large storks and rows of flamingos. 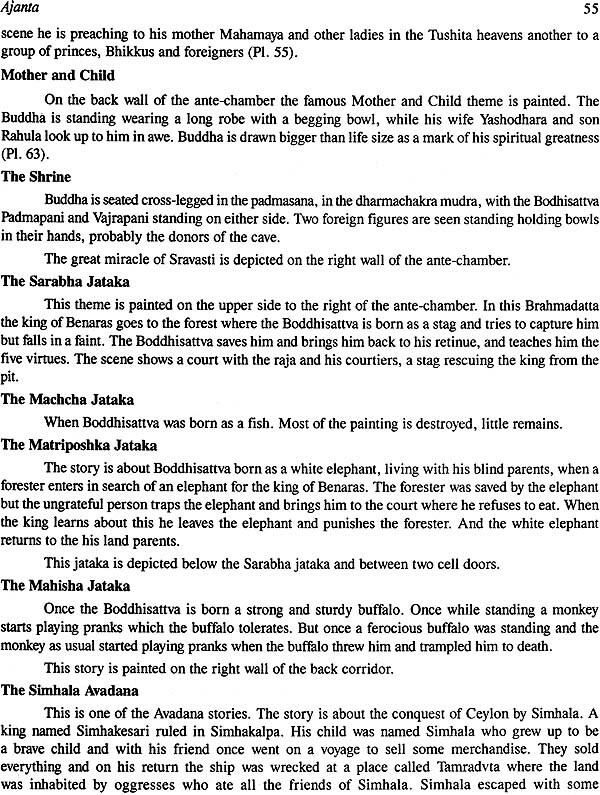 The old Jataka tales often talk of Banaras cloth while other fold tales mention bright yellow robes called Gandhara. Interestingly at Mandsaur in the erstwhile royal state of Gwalior, there still exists a stone inscription of the 5th century A.D. recording how at an earlier but unspecified date an entire community of silk weavers had migrated from one region to another in order to establish themselves in the market town under royal patronage. References in Vedas and the Vedantas to the cloth of gold suggest the antiquity of the Indian Kamkhab brocading though the technique may not heve originated in India. In the Artha Shastra there is a mention of how during the Mauryan period (3rd century B.C.) workshops were established for the production of designed textiles. The Ajanta paintings present a mystifying maze of textile patterns. It is difficult to indentify the fabrics whether it is cotton, silk or some other. Byt if a profound analysis is done, certain broad distinctions emerge. The most observed designs in the Ajanta textiles are the horizontal and vertical bands filed with geometrical desins like chevrons. Circles, stripes or quite close to the designs found on the Burmese waist clothes. Also there the formal floral motifs and scrolls, sometimes enlivened with processions of sacred geese, or diagonal bands of these geese. Beside there are patterns made up of simple dots or groups of dots Stripes appear in three varieties. Beaded bands, ladder patterns sometimes in combination with thick and small checks. The textiles also show crosses, lozenges in horizontal bands, stars, diamond shapes, triangles and tiny flowers. Sometimes the cloth simply has a border adorned by pearl strings or are embroidered. But very rarely does one come across animal or bird patterns. But there are enough instances of fine muslim cloth, worn exclusively by the royal ladies probably the Magnamsuka type which has been referred to by the ancient historian Bana, Even the ancient Creeks admired this cloth. In fact so much that they used to compare it with the slough of serpents or the vapour from milk. One can visualize the sheer savoir fairs of the artists who created textiles of such finesse and excellence. Apart from these, there are several specimens of cut and sewn garments. In one or two illustrations, even the stitches are transparently sketched. The indoor constumes of women consisted of a waist cloth of varying length and texture, usually supported by a beaded or jeweled belt. Occasionally a breast cloth is seen and sometimes a muslin scarf. Some of the knee length dresses are tight fitting and open on one side or on either sides. Upper garments were not common but there are a number of examples of blouses, some long sleeved. Some short sleeved and even some sleeve less ones. The Odhni was not worn to cover any part of the body, but as a playful lover’s gesture. The ghagra or the gathered skirt is conspicuously absent. Significantly, a number of lower garments worn by females resemble the typical Maharashtrain kashta type of sarees. The waist cloth was the chief costume of men, but hunters and forest dwellers wore small loin cloth. Soldiers and horsemen wore a long sleeved tunic dwon to the knee. Jackets ended above the waist and were embroidered at the wrist, upper arm neck and sometimes down the front. In one of the frescoes in cave no. 1 a ceiling scene identified as the Persian embassy some foreigners are shown wearing pointed caps, long sleeved tight fitting tunics, tight trousers and boots. Other paintings show men wearing socks and mufflers. The cave are strewn with illustration of bedspreads with geometrical and tiny floral designs. Kings are shown either seated on ottomans or resting against bolsters decorated with dotted, floral, banded or geometrical designs. Nature and environment have surly inspired the motifs and patterns of the Ajanta textiles. Stylized floral. geomericl, linear and diamond shaped compositions in fascinating colours from nature abound. Large vivid geometrical shaped in intricate schemes of exciting tones of purple, yellow, brown. Red, green, white, black and Persian blue reflect a rare creativity accomplished with consummated skill. I filt Ajanta paintings had a deeper content than would allow at first sight. A mere cursory study list not sufficient to comprehend the spirit of Ajanta. Its eloquent line work is pregnantly expressive, magnifying the obscured and veiled lines of ornaments, anatomical particulars of the humans being accentuating their facial contours, lines and rofiles, flora and fauna, textiles if minutely studied are articulate elucidating the idiom, style and diction so fluently, that a deep appreciative subreption of movement, bustle and animation is aroused among the viewers. The line drawing and painting which genuinely impressed me and had me absorbed and ruminating was a fascinating recreation of the forces of temporal power, an illusion to dissuade the Buddha from his mission. Envisaged by the artists of Ajanta, te Temptation of Mara is a feast for any viewer who can penetrate its artistic grandeur and idiosyncrasy. The story telling quality of the painting, the unity of the composition and the ingenuous disposition of the composition and the ingenuous disposition of the figures attest to the mastery of the painter’s art. The human mind has visualized and conceived this scene, supported by fantasy, mythology and legend so sublimely and flawlessly by that it has reached a pinnacle of masterly creative. This scene at Ajanta, painted in Cave 1, on the left wall of the antrala, portrays Buddha practicing austicing austerities which he knows are likely to lead him to the discovery of Truth. Initially Mara sends his daughters to seduce the Buddha by singing and dancing but they return defeated. Then angry he creates a vision of demons, ugly, horrible creatures with a thousand mounths, potbellied and deformed, drinking blood or bevouring snakes, uttering inhuman cries, spreading darkness, armed with spears bows and maces. This hallucination of malevolent elements proved ineffectual in confronting the supreme power of Buddha and the threatening elements only find themselves paralyzed with their arms bound to their sides. The role of belief in Mara in Buddhist History appears to have been to provide transition from popular nations to discarnate evil demons to the more abstract analysis of the human situation in mora and phychological terms. It showed a helpful way of understanding resistance to the holy life which a man might encounter but which he is assured can be overcome by following the Buddhist pat. Like Mephistopheles or the devil of western religious thought, Mara is regarded as a demoniac being who is an arch enemy of all who seek to live the holy life, According to Buddhist tradition Mara sought to deflect the Buddha from attaining Nirvana. This panel has succeeded in unraveling the mysteries of Ajanta painting which; give us an insight into the absolute mastery of the Ajanta artists over line work rather than painting. This painting is a masterpieces of the Ajanta artists. In these caves there are scores of other paintings hitherto unnoticed by art levers, but it will take day before-can unveil them one by one.